+Provides a listing for episodes for tvshows in the Kodi library that are airing within the next 2 months. +CAUTION: Requires script.module.thetvdb which is not yet in any repo (BETA stage), get it from github for now. +Provides the next unaired episode for each tvshow in the library which is airing within the next 2 months. Is it possible to show aired date from this content ? I use it for my widget. A log was posted on the TvTunes Screensaver forum and there are a lot of script errors coming from the "Skin Helper Service", didn't know if it was of any help. just a question, do skinhelper re-check the media sometime if new Art/Albums are added? because MB server are still kinda broken?! (2016-07-14, 22:53)Guilouz Wrote: [ -> ] When I create my shortcut for my widget here, widget not working. Normal there is no item in this folder. Just need folder for 'Trackt', 'Rotten Tomatoes' and 'MovieDB'. When there is a sublevel detected, it will follow the default skinshortcuts behaviour of probing the path. 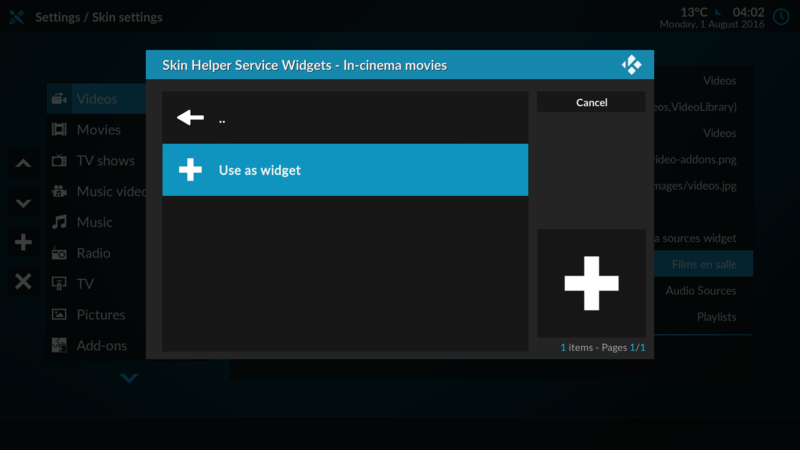 So, just enter the entry and select the "Use as widget". That should work fine. (2016-07-18, 20:34)mikpj Wrote: [ -> ] I have been over these errors. Your system is messed up, missing files. Perform a reinstall instead of manually copying over files and stuff. (2016-07-24, 19:52)im85288 Wrote: [ -> ] I'm experiencing something particular strange in that if I navigate to the video library using the standard method from the home menu (ie ActivateWindow(Videos,MovieTitles,return) ) then everything works correctly such as having the skin helper properties populated. However if I navigate to the same action via a custom window (in this case a movie hub) then nothing is populated....I cannot think of any logical reason as to what would be different/causing this to happen. Are you using the WidgetContainer property to populate the properties for your custom container(s) ? In that case make sure to flush that property once you navigate away from your custom window. 1. Where do I have to set "SkinHelper.EnablePVRThumbs"? Is this correct? and it works to display "Poster". But if skinhelper does not find a poster the skin shows nothing. Do I have to use "type=Thumbnail" instead? 1) I believe your first question has already been answered, right ? Strange situation with PVR Artwork in folder for one evant. downloaded cdart for this evant is broken. all back to normal and kodi show disc...ad pvrdetails.xml now change this line for discart. Can you change insted of "/cdart.png</discart>" in pvrdetails.xml first choise to be "/disc.png</discart>",or remove cdart for pvr. Now after open new evant need to open auto lookup to have discart.this hapend for all movie evant for PVR. is this need to have both discart ? Dunno if this is an issue on your or skinshortcuts side, but smartish widget paths aren't adjusted for Krypton yet (VideoLibrary -> Videos, ... ). If I use as widget here it's ok. If I use as widget here. Not working. Just a quick one, for the new tvdb addon (in beta) maybe it would be better for those calls to be using the new addon ID rather than skin helper. Heads up for all skinners that are using the skinhelper addon. I'm in the process of (slowly) migrating stuff into seperated addons and module libraries for better code maintenance. In the future this means that several parts of the skinhelper features can be used as a seperated addon or as module/library for other addons. It may seam more complicated to have multiple smaller addons/modules instead of one large one but it allows me to better maintain the code and allows for more flexibility. For example, if you only need a color picker you can just only use the colorpicker addon instead of having to use the whole skinhelper addon. The current skinhelper addon will stay to exist as the "parent addon", including all modules so nothing will have to be changed skinning-side. Atm it's a little problematic maybe if you are using the latest version from Git. In that case you'll have to make to also download the new modules untill those are added to the Kodi repo. 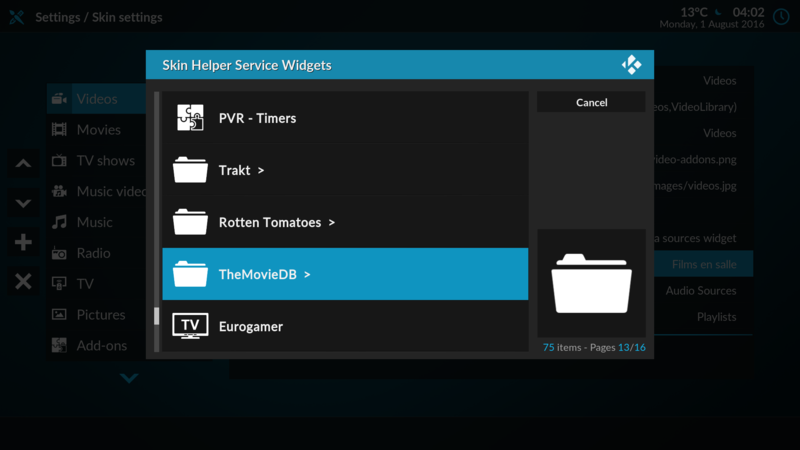 Make sure to install those on your Kodi install before trying to update skinhelper from Github. The following weeks I will be busy migrating code and while at it, making sure to do some code review/optimimalisations. I'll notify here once things are in place. 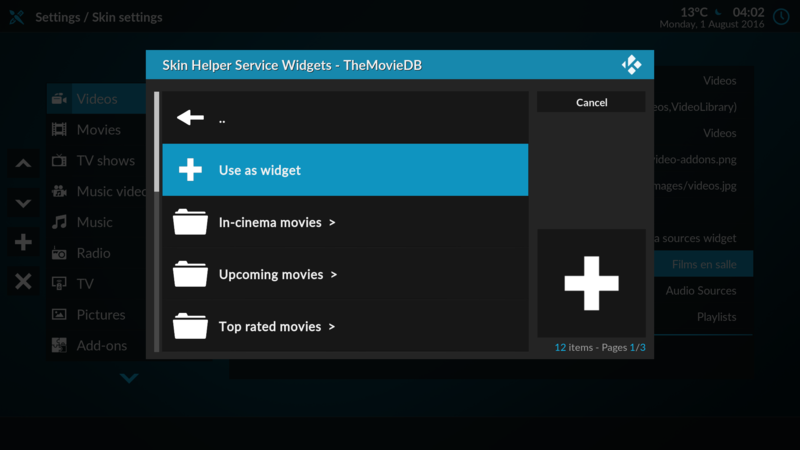 Offcourse all new scripts and modules come with a readme on Git and will be added to the Kodi repo. If there are no objections I will add this to the Jarvis (and up) Kodi repo, meaning that Helix and Isengard will not be updated and stay on the old, current version. (2016-07-29, 14:47)robwebset Wrote: [ -> ] A log was posted on the TvTunes Screensaver forum and there are a lot of script errors coming from the "Skin Helper Service", didn't know if it was of any help. Thanks for the headsup Rob. The errors are all known (and caugth by the scripts). Seems that his skin is calling the script with params that do not yet exist on the Kodi repo version of the scripts (as the update is pending). Will be worked out once the scrip updates on the repo. Musicbrainz errors are also fine, they had some server issues last weeks. (2016-07-30, 00:49)meowmoo Wrote: [ -> ] just a question, do skinhelper re-check the media sometime if new Art/Albums are added? 2) Musicbrainz indeed had some server issues but those should be fixed, although I believe they've hardened the rate limiting a bit more. Current Git version of the script contains setting to use a MB mirror. Be aware that if you want to test the latest Git you'll also need some new modules from my Github. BTW: I guess that your issue no.1 was because of the failing MB servers last few weeks.